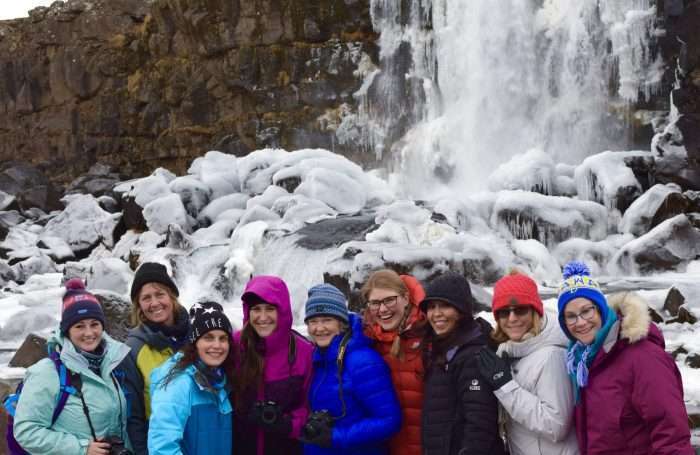 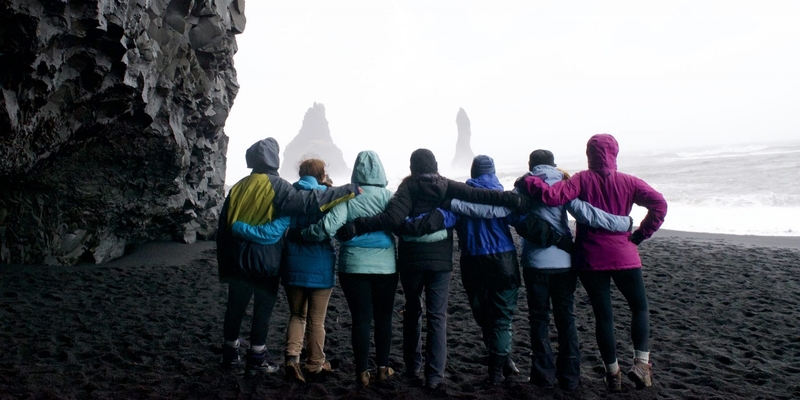 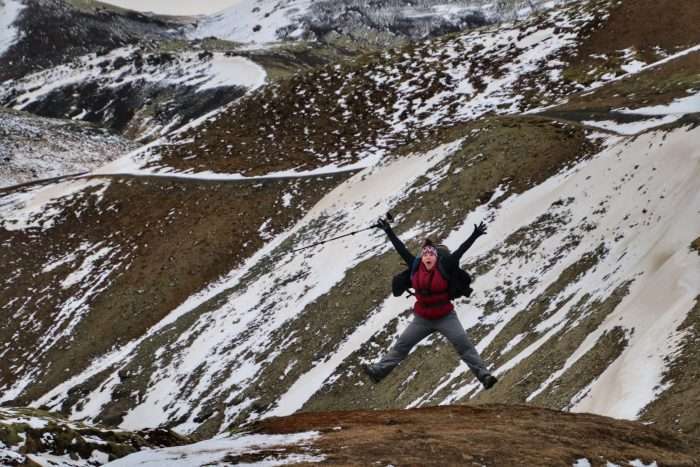 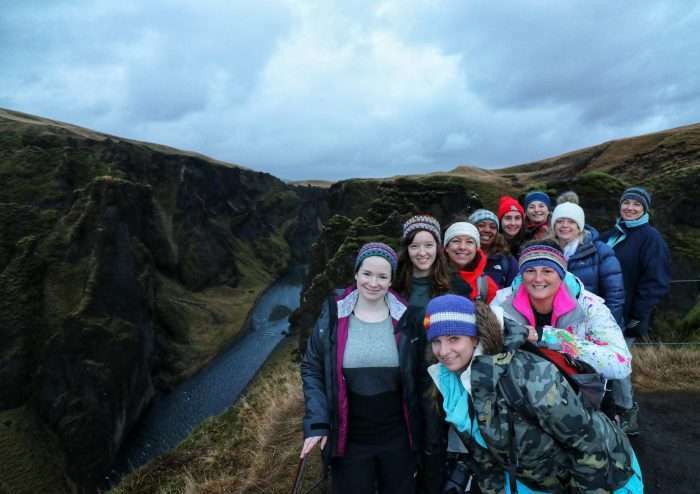 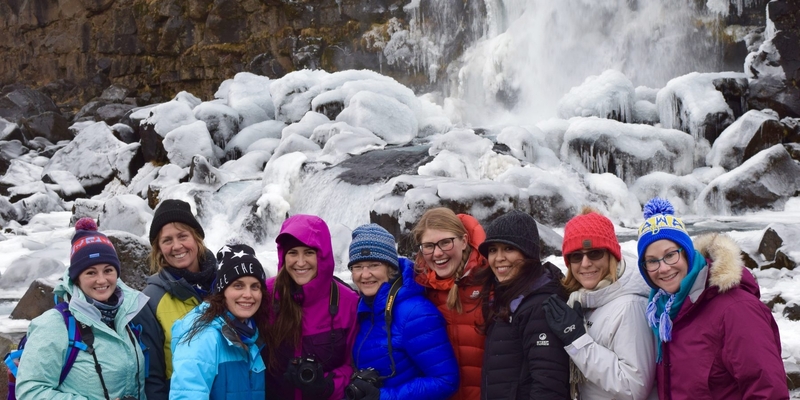 Chase the Northern Lights in Iceland while embarking on incredible Multi-Sport adventures on our Women Only, Small Group Trip in Iceland. 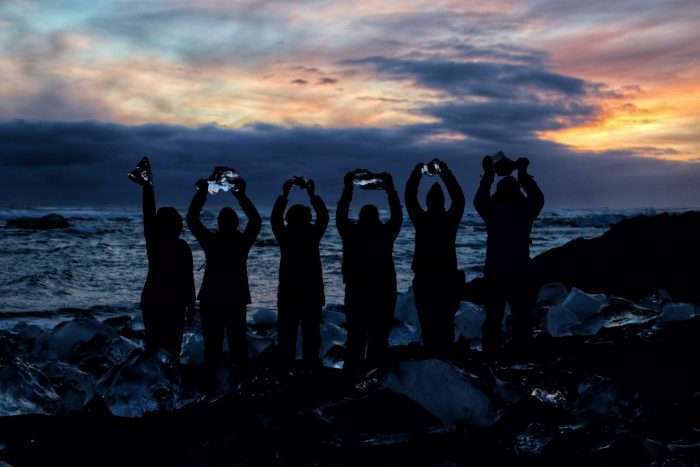 Of course, we won’t miss a second of the daylight! 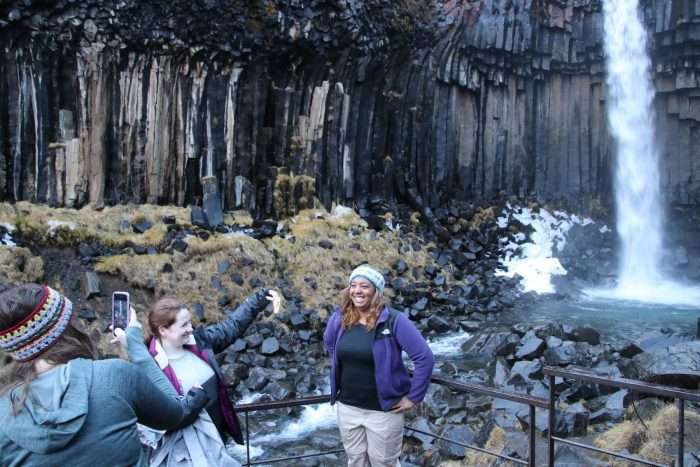 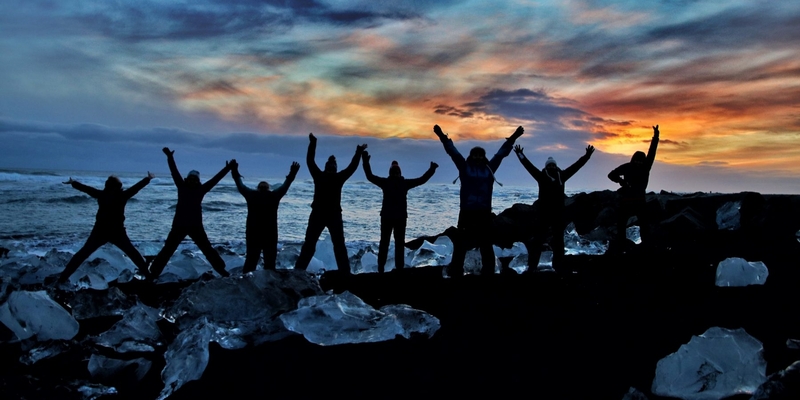 You’ll go to the world of Fire and Ice to venture out on adventures unique to Iceland! 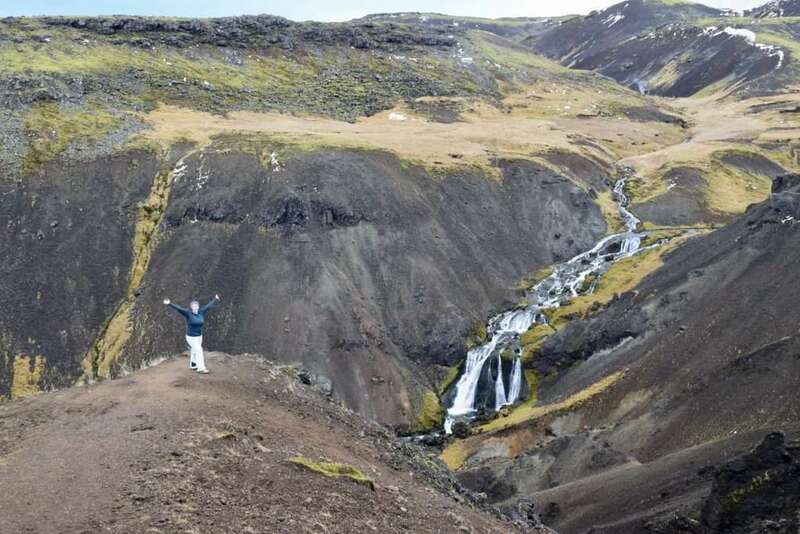 You’ll experience the best of southern Iceland as we board our Private Mini Bus to road trip along the coast chasing waterfalls, trekking across glaciers, and searching for the Northern Lights. Every day is a new adventure and every night is a chance to catch the dancing beams of light. 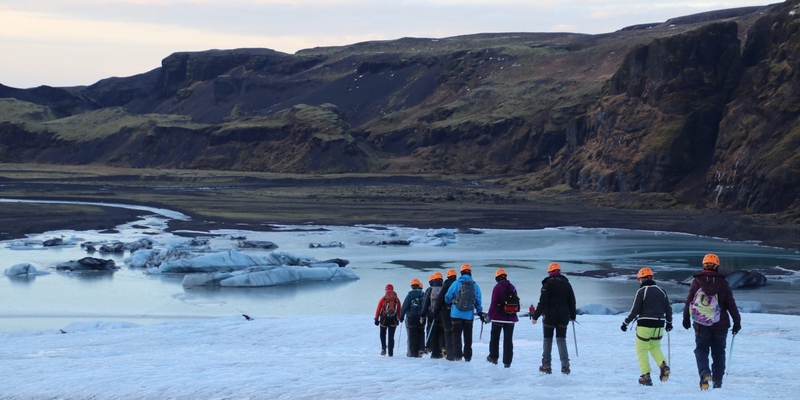 We depart Reykjavik first thing on Day 2 to journey far from city lights. The next four nights are spent in traditional Iceland Guest Houses and Hotels surrounded by pitch black darkness at night. 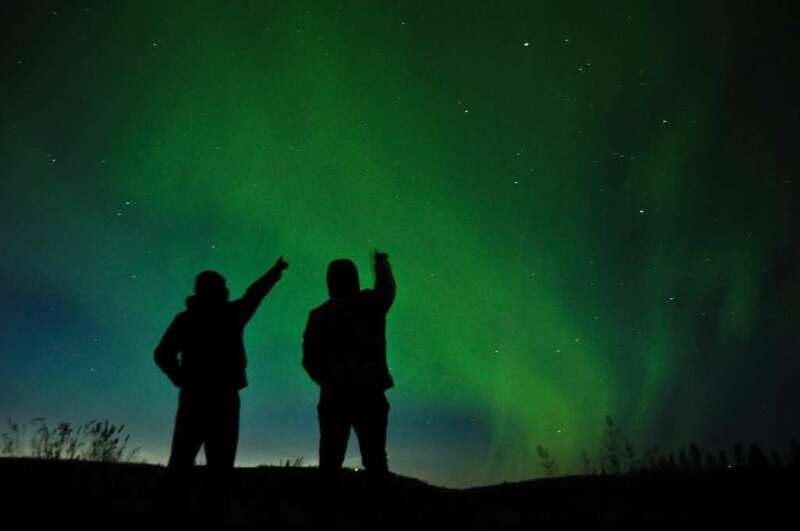 Perfect for checking the forecast, setting up a tripod, and casting your eyes to the skies to spot Aurora Borealis. The daylight hours will not be wasted! 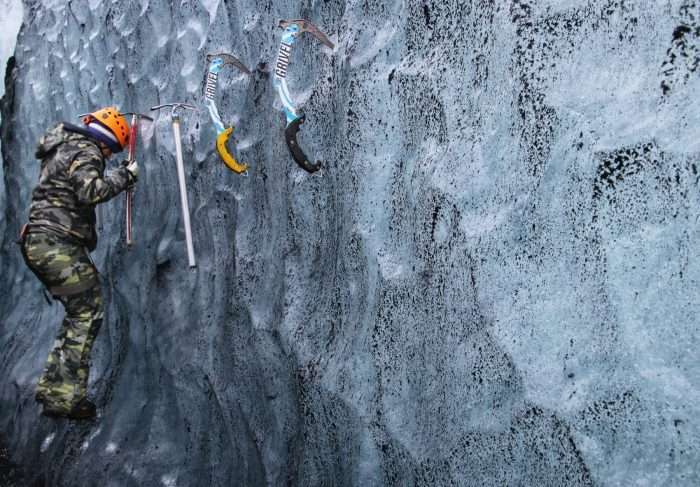 Every morning we’ll load up to adventure outside. 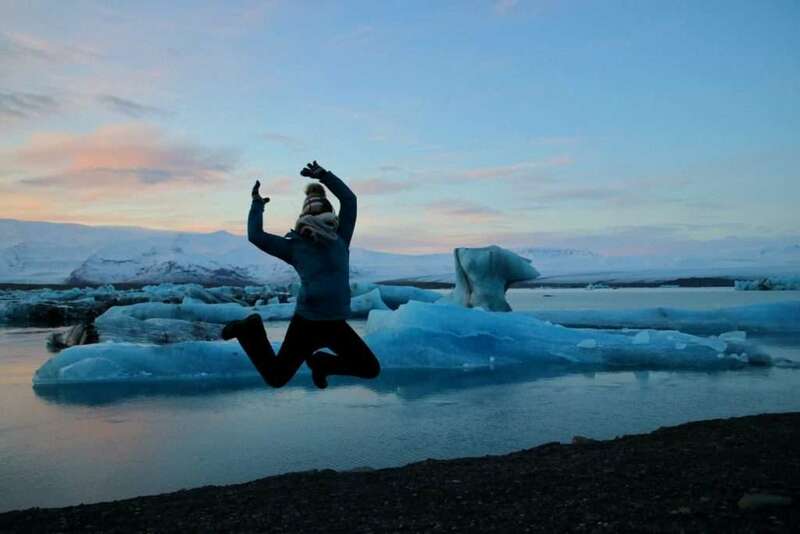 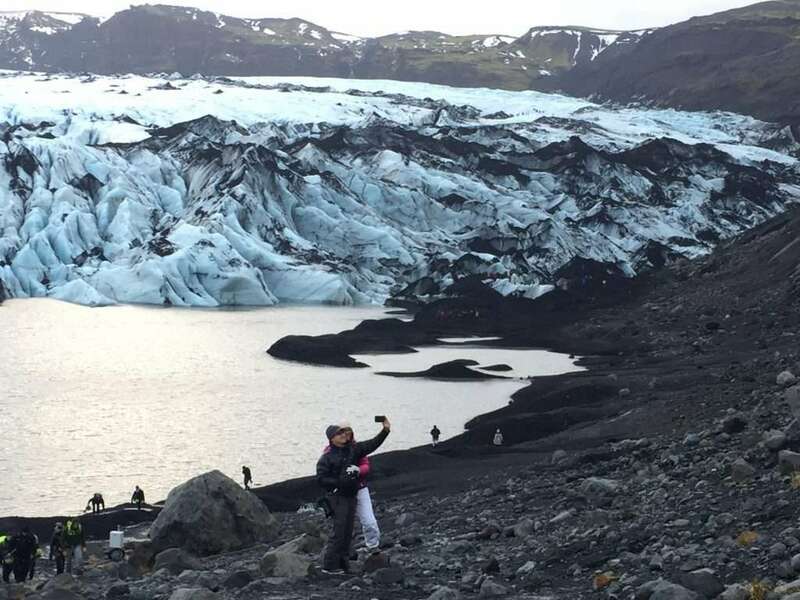 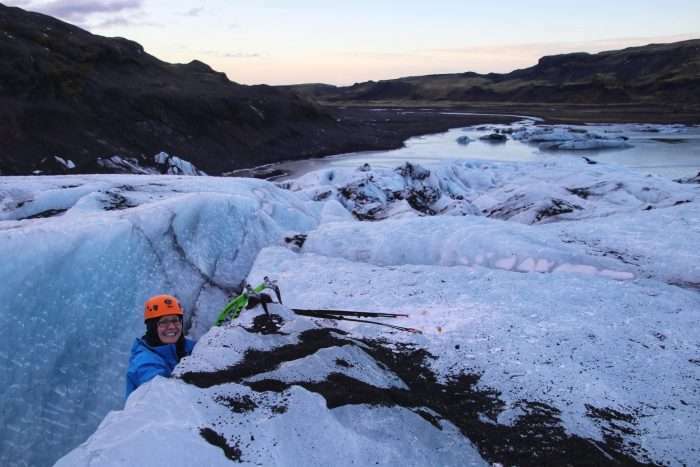 It’s Iceland, so you know we’ll be playing on some glaciers – Three different ones! 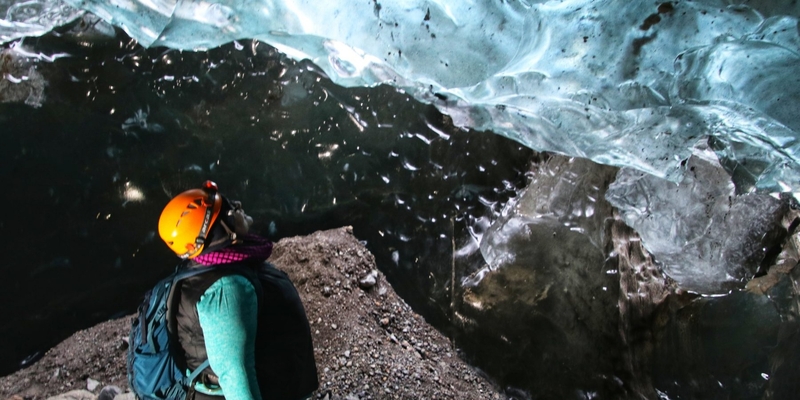 You’ll gear up in insulated suits to traverse glaciers by Snow Mobiles. 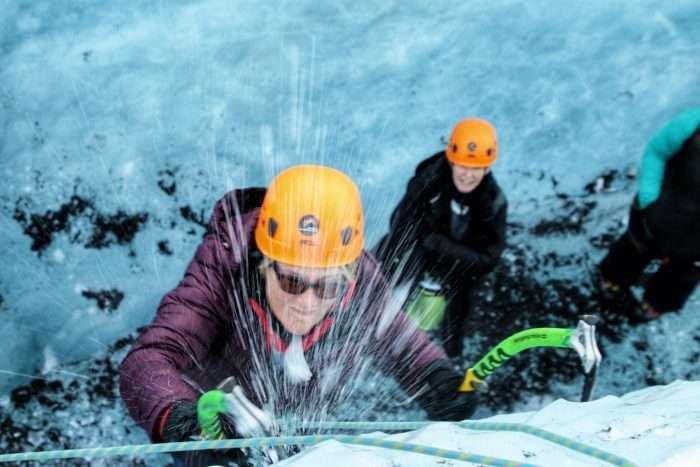 You’ll channel your inner alpine chick to stick your crampons and ice axe into a glacial wall to send your first Ice Route. 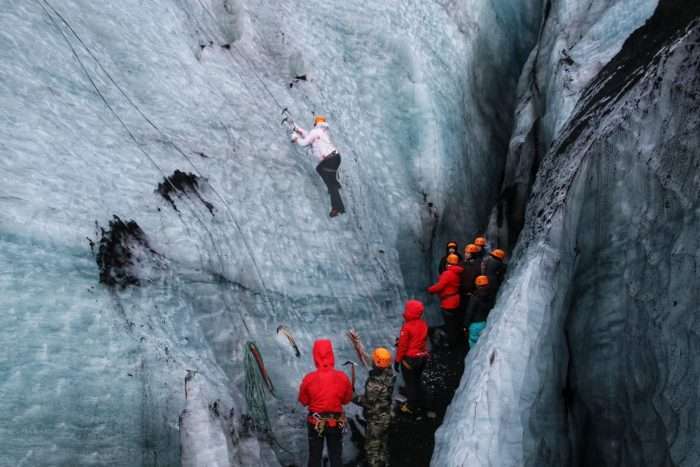 (Yes, you CAN Ice Climb!) 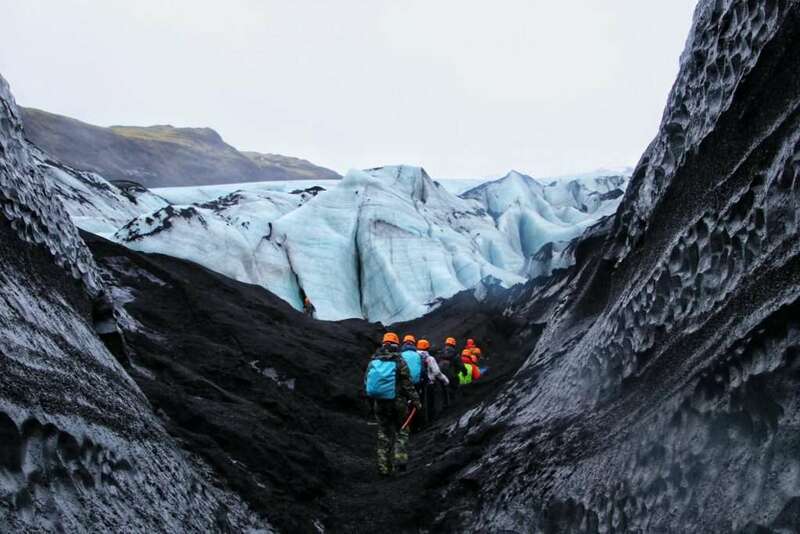 You’ll fall in love with the contrast of the white hues of the ice against the dark black of volcanic ash and vivid greens of the landscape. 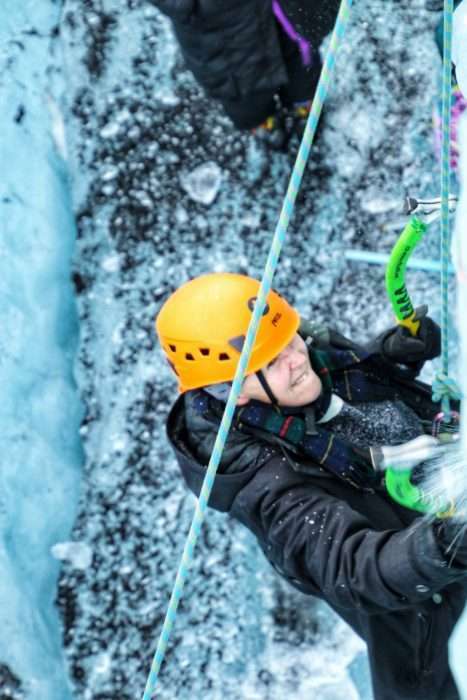 Sound exciting? 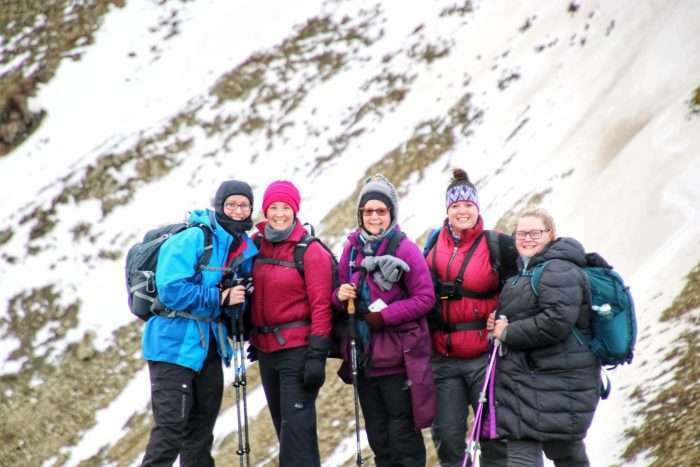 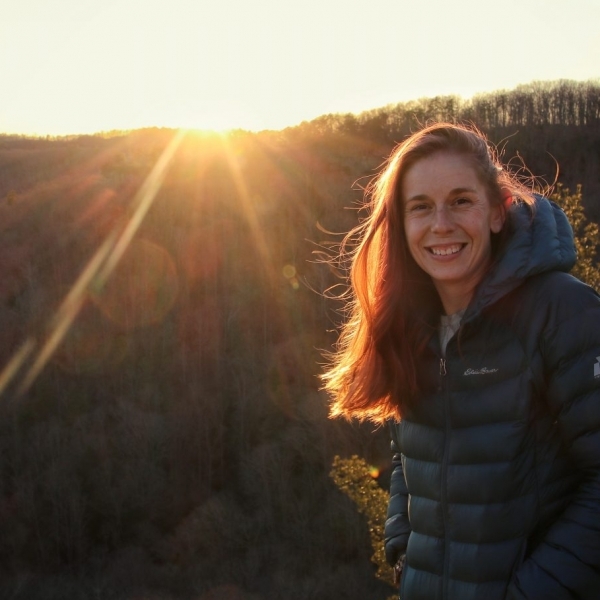 You’ll also be with a local and an Explorer Chick Guide who will be planning your adventure day by day to take advantage of the weather and the daylight. Hey, it’s a road trip where we call the shots! 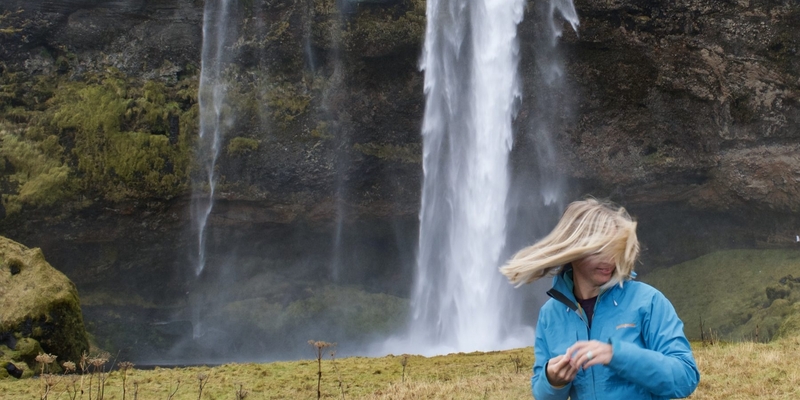 No rigid schedule, but a trip that flexes and flows so you get the best vacation. We’ll be sure to stop at local favorites for ice cream, shopping, and if you behave, a micro brewksy! 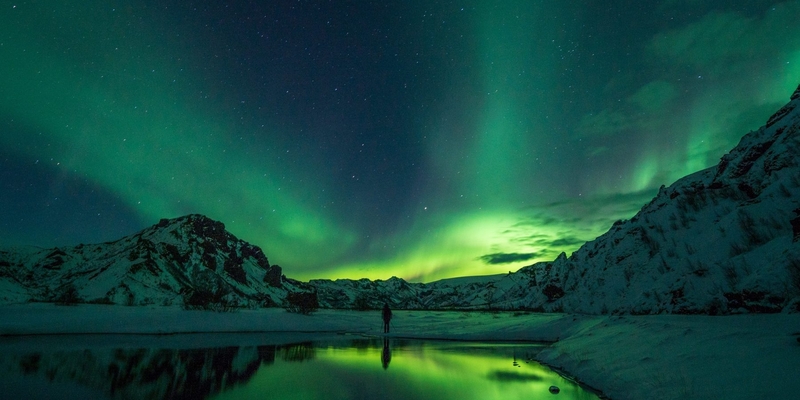 Chase the Northern Lights in Iceland while staying in charming, remote accommodations. 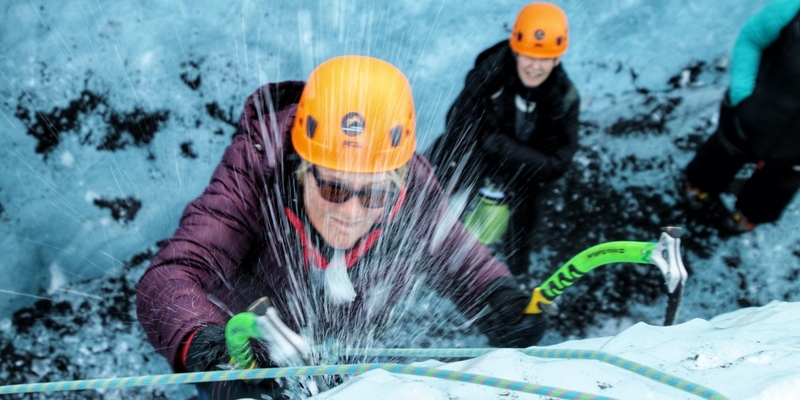 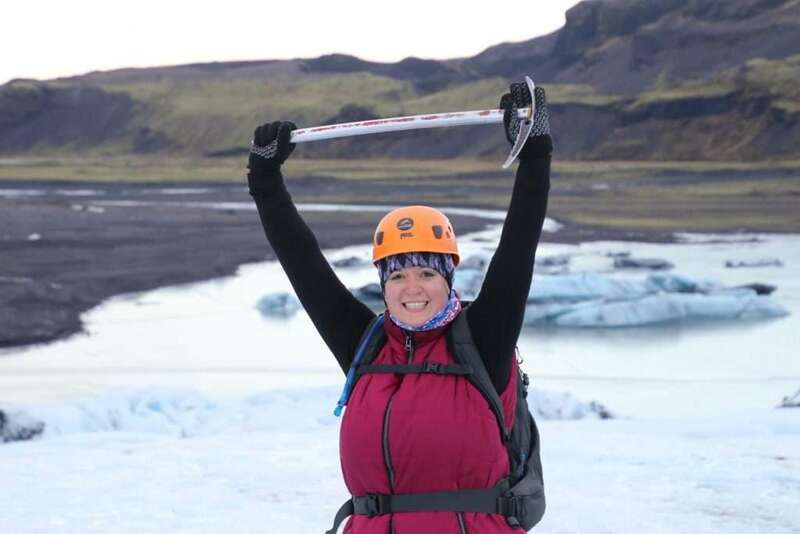 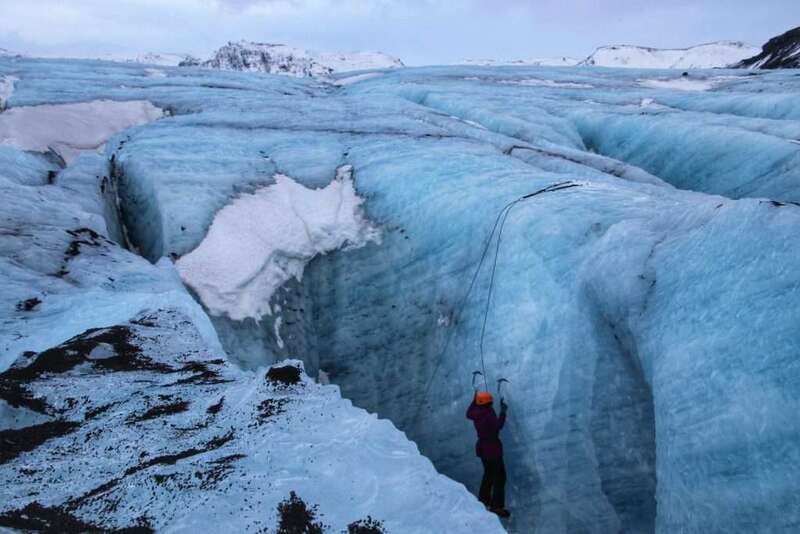 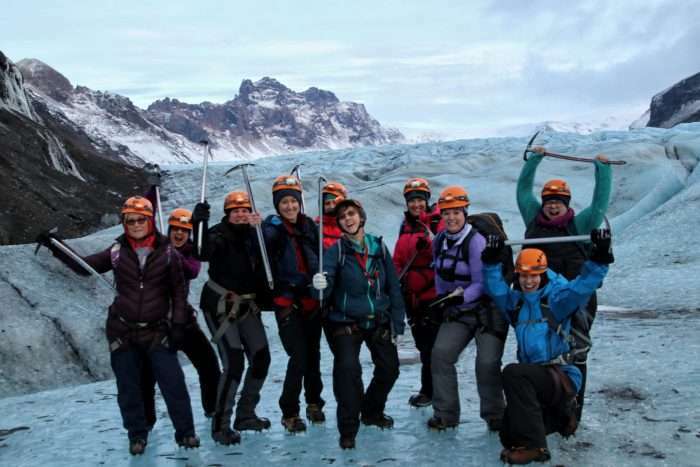 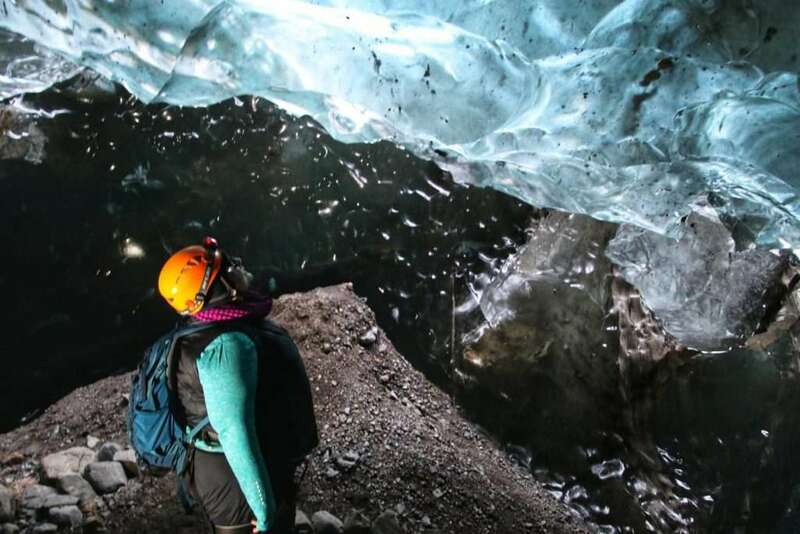 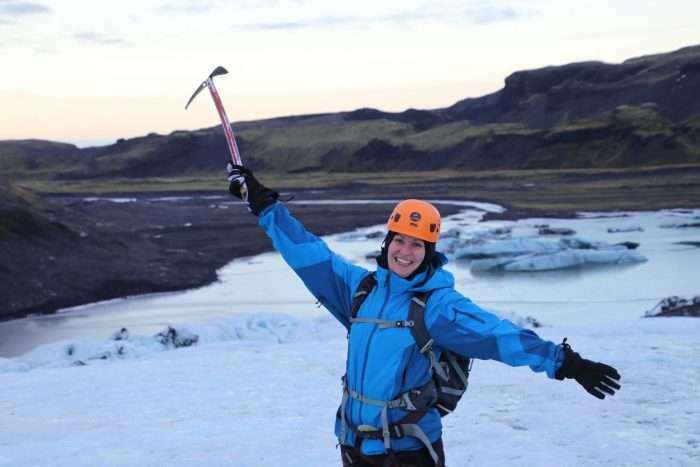 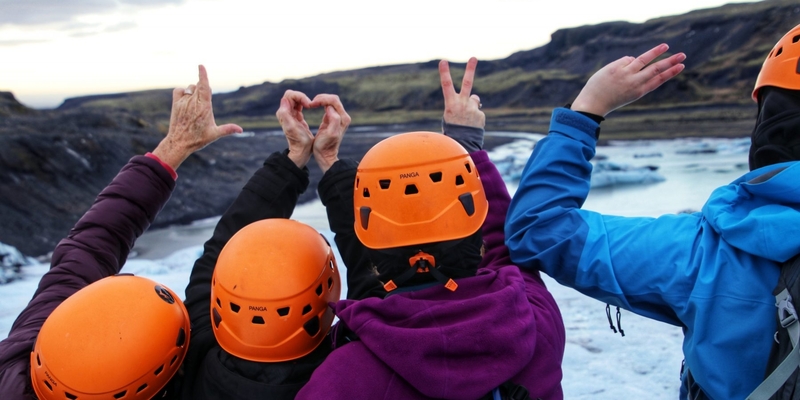 Ice Climb like the bold woman you are on Sólheimajökull Glacier with all technical gear and instruction provided. 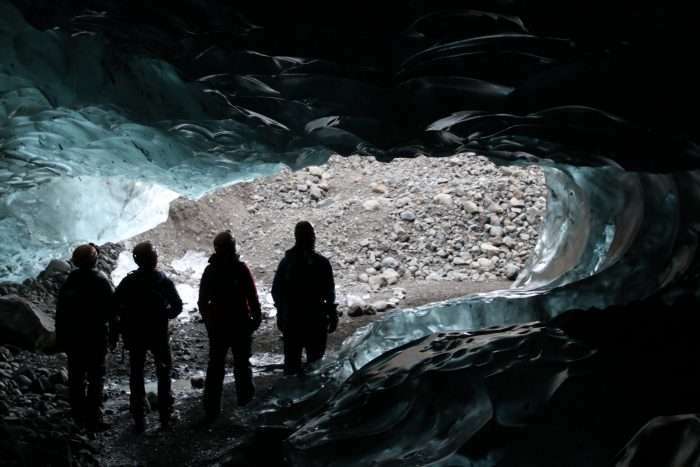 Explore an enchanting glacial Ice Cave that can only be accessed during the cold winter months. 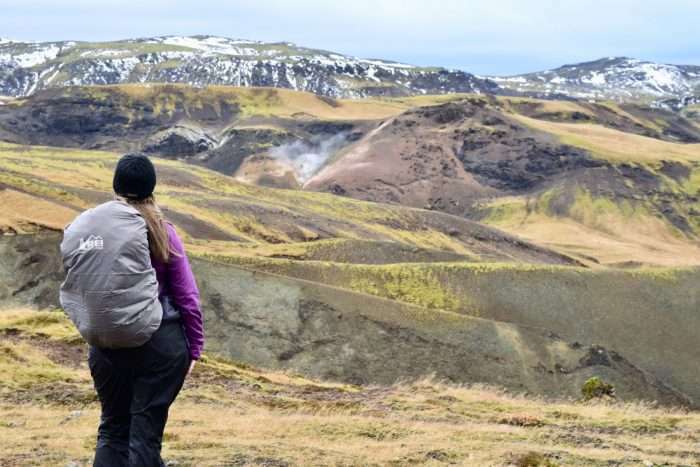 Hike through an enchanting river valley with steamy boiling pots to soak in a natural hot spring. 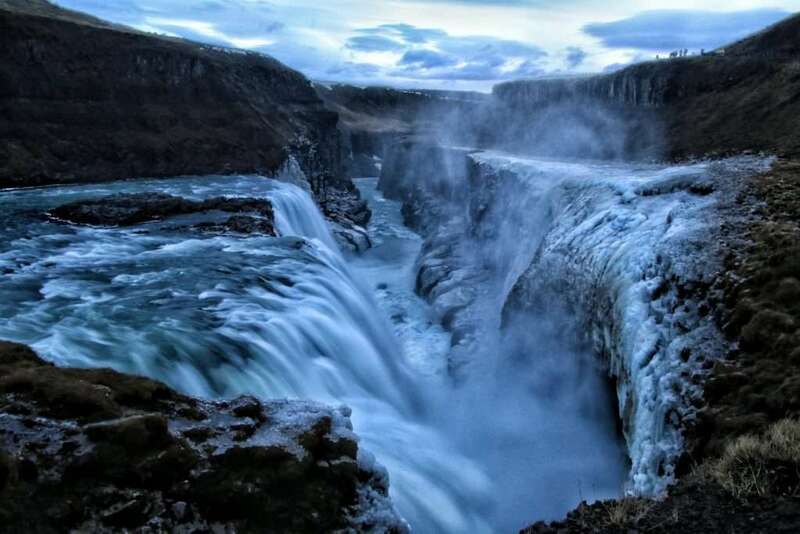 Explore the famous Golden Circle trifecta of destinations – Þingvellir National Park, Geysir, and Gullfoss. 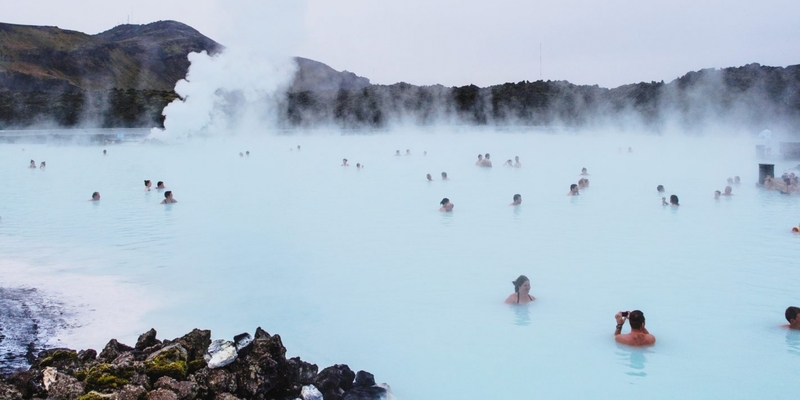 End your adventure soaking in the geothermal waters of the Blue Lagoon and soften your skin with a silica face mask. 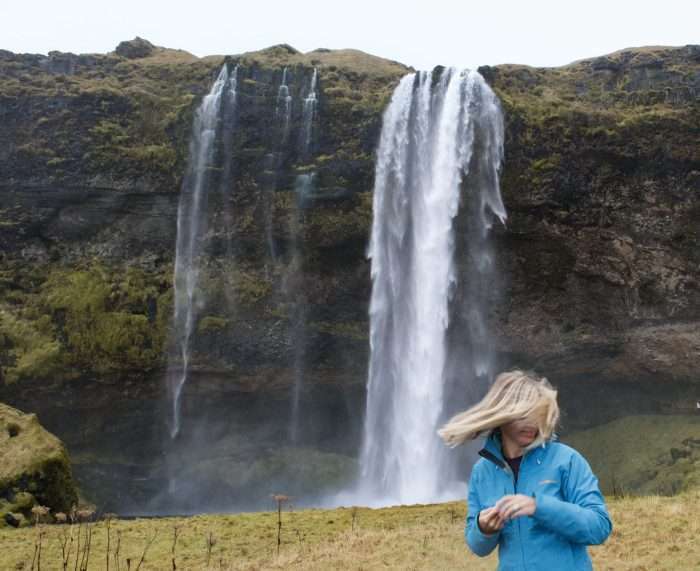 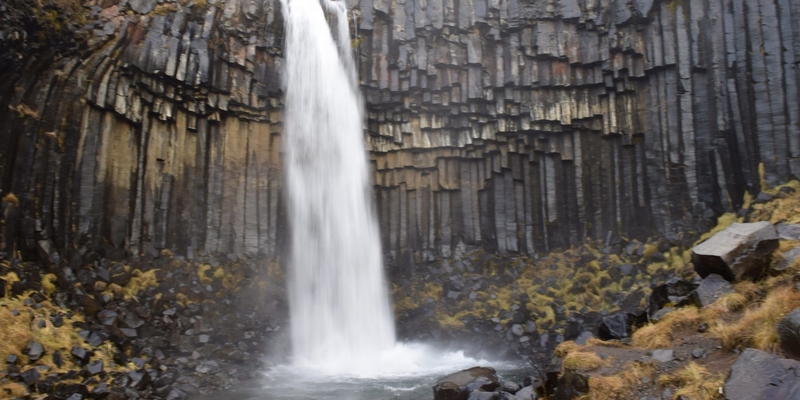 Soak in the iconic sights of Iceland’s southern coast including Skógarfoss Waterfall, Dyrhólaey, Glacier Lagoon, and Seljalandsfoss with private transportation. 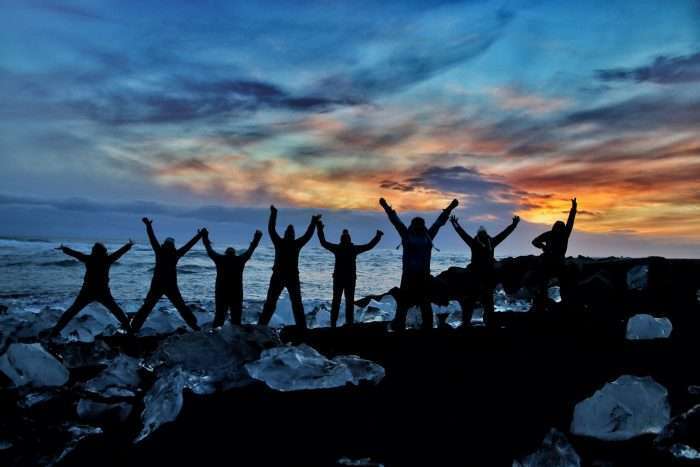 Catch the early and unforgettable magic of an Iceland sunset. 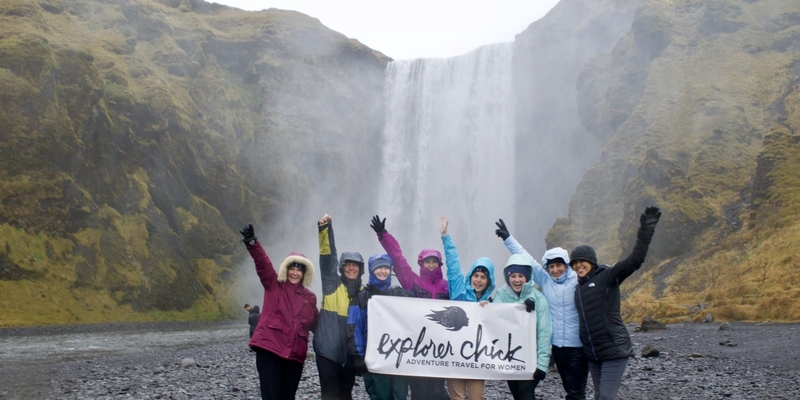 Live it up aboard our private transportation as your local and Explorer Chick guide make unplanned stops and surprises along the way. 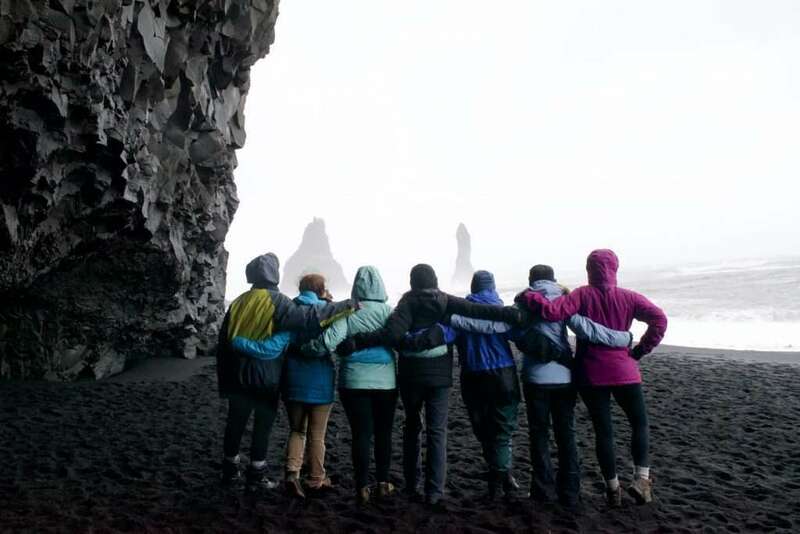 It’s your trip! We can do what we want! 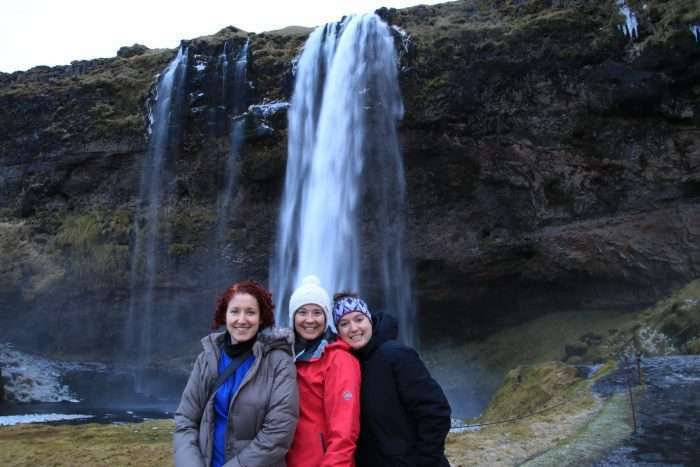 2 nights Reykjavik Guesthouse (Shared – 2 per Room) – Basic lodging centrally located and within walking distance to pubs, shops, and sites. 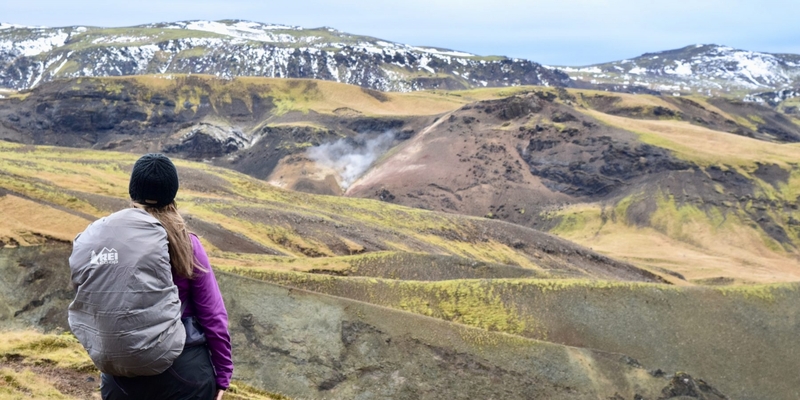 No frills, standard rooms – not hotel rooms. Shared bathrooms. 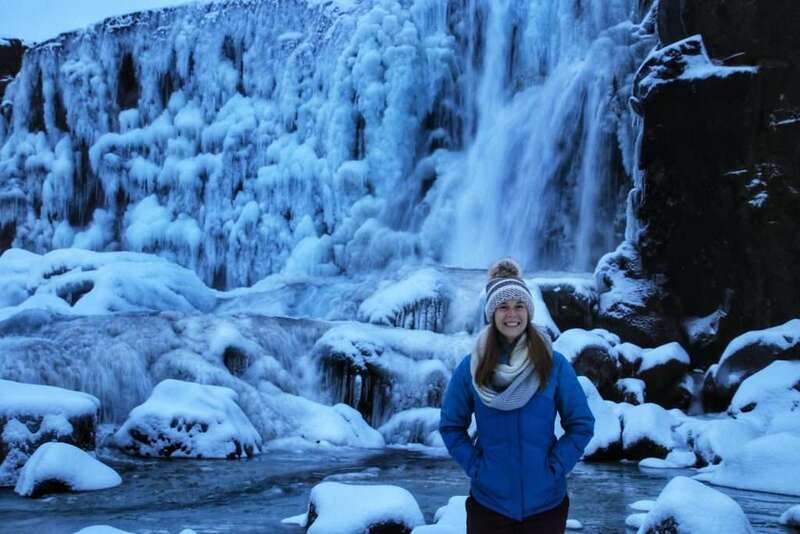 4 nights Guest House accommodations (1 night in Selfoss, 3 nights in the Southeast) – Shared – 2 per room. 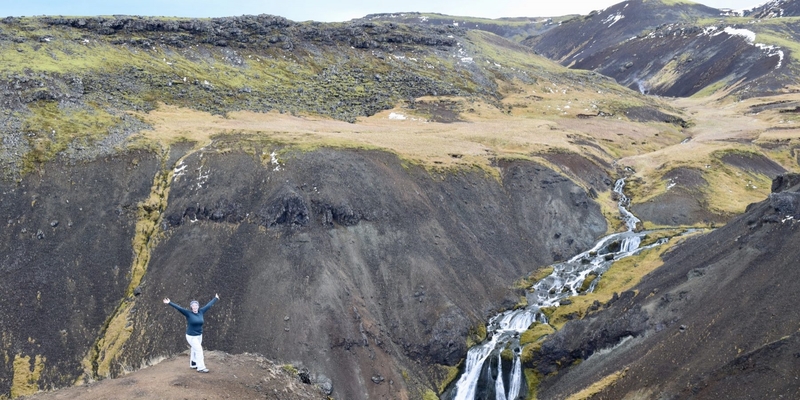 No frills, standard rooms – not hotel rooms. 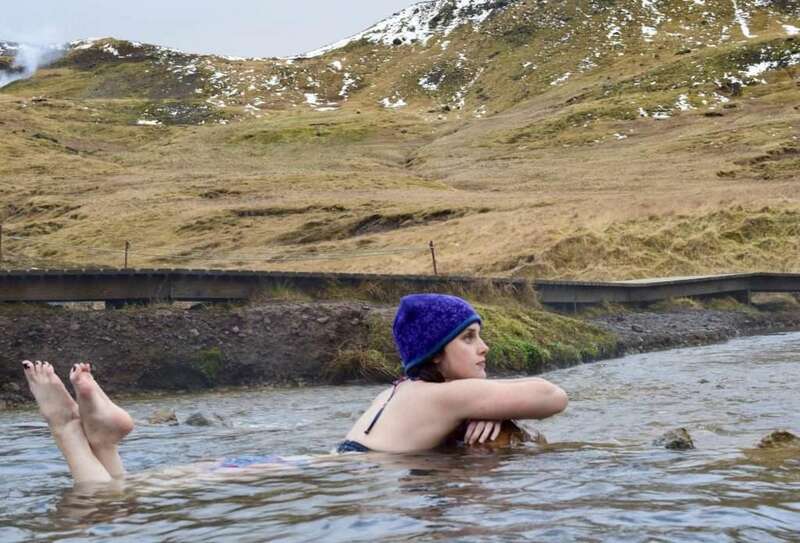 Shared bathrooms. Snow Mobile Tour across a glacier with all gear provided. 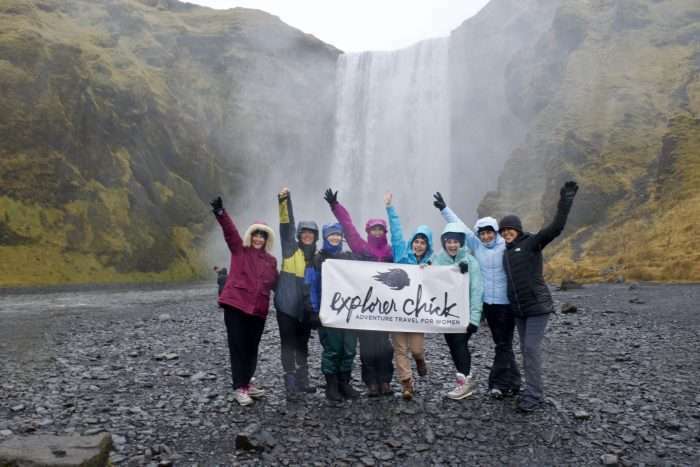 Private Explorer Chick land-transportation throughout itinerary including departure airport transfer only. *Packages do NOT include your airfare, arrival airport transportation, alcoholic beverages, travel insurance, Explorer Chick Leader Tips, meals exclusive of itinerary, or costs for additional activities. 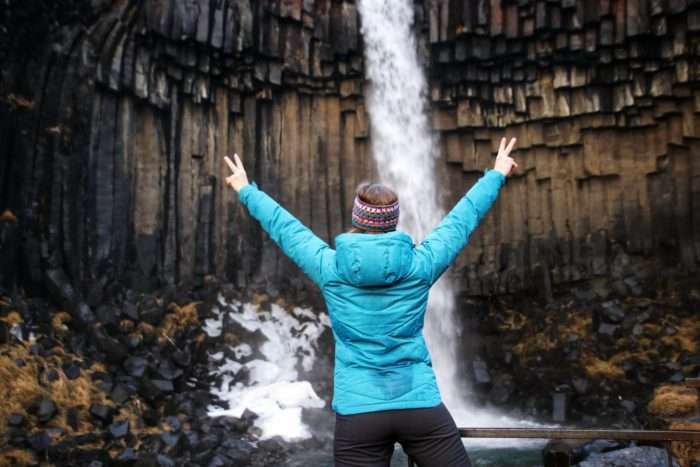 Your trip begins and ends in Reykjavík, Iceland. 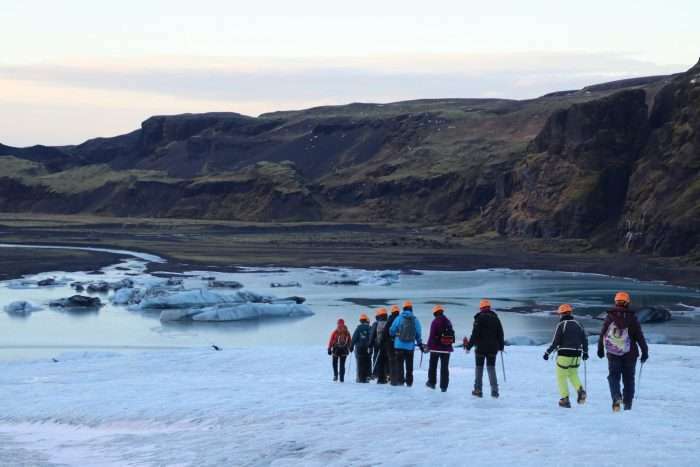 Your arrival airport transfer in Reykjavík is NOT included with your package. 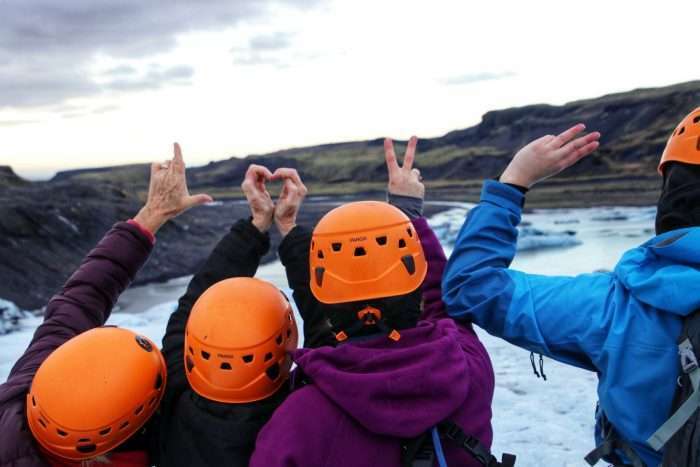 There are several options for booking your transportation including public shuttle services. 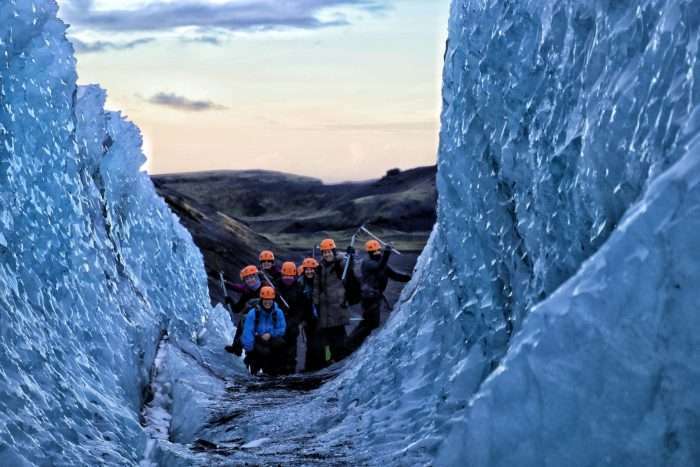 You will receive a travel guide attached to your booking confirmation with all the information you’ll need to prepare for your epic trip including our Rendezvous guest house. Please confirm your trip is guaranteed before booking your airfare. 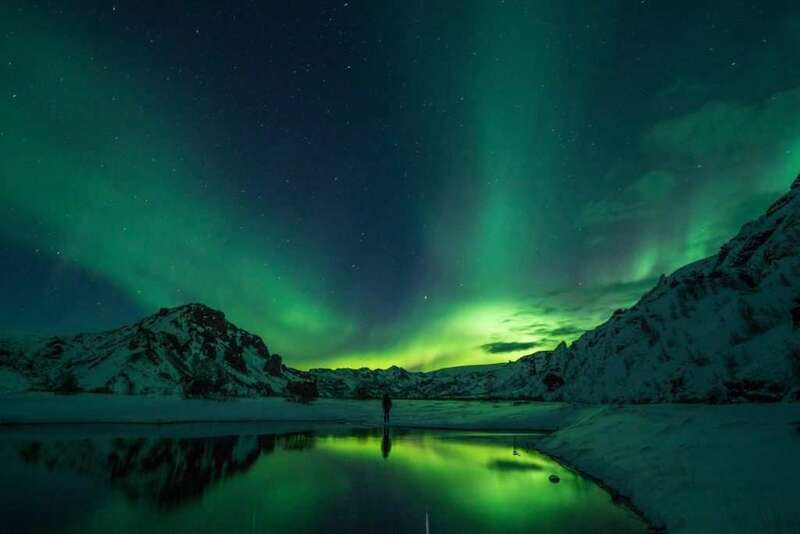 Your Northern Lights Winter Iceland Adventure is geared toward viewing the Northern Lights, seeing the south coasts best landmarks, and enjoying the best of what Icelandic winter’s have to offer. 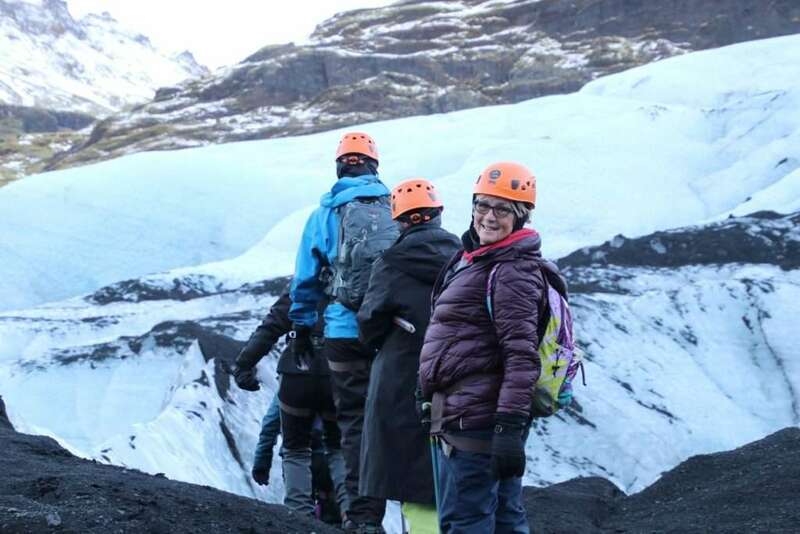 Although we rate this trip as easy to moderate, you will still spend quite a bit of time on your feet – including in crampons! We highly recommend training prior to your trip in all conditions to arrive with a base level of fitness. 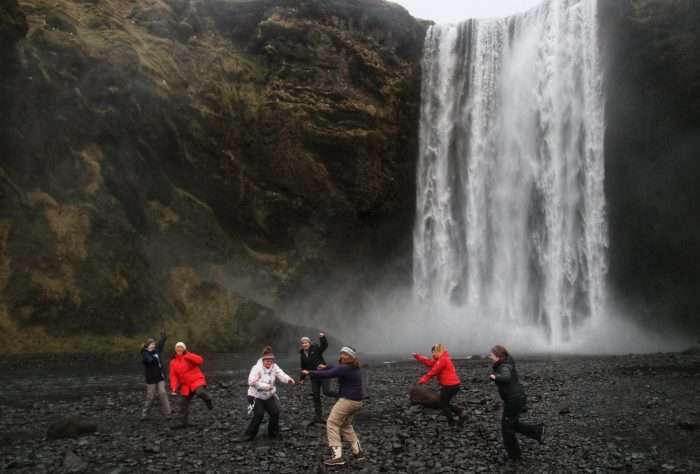 Train how you play!